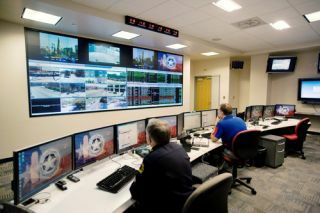 Christie MicroTiles were recently installed at the Dallas Police Department’s 24/7 Fusion Center, in a 6 units high by 12 units wide digital video wall. The 72-unit display is part of the Center’s comprehensive technology upgrade to fight crime in the City of Dallas and to gather and share intelligence information with state-level and Federal Homeland Security. In 2010, the Dallas Police Department, with major funding from Homeland Security, upgraded its training and special event operations room into a new Fusion Center, merging information from separate 911 Center, city wide surveillance cameras, tracking systems and investigative analytical databases to improve functionality and response times within the new intelligence operations center. Equipped with new consoles, a SMART Board, intelligent switching capability, and visualizing data from more than 25 sources, the Dallas Police Department, through AV solutions provider, Whitlock, selected Christie for its visual technology. As a result of the technology integration, up to 27 Fusion analysis detectives per day have the added ability to monitor a comprehensive common operating picture displayed on the MicroTiles wall in real-time. “Our detectives monitor close to 100 cameras all around the city, including officer locations, calls and national live events, so the Dallas Police Department needed a video wall that could help us maintain our 24-hour operation,” said Paul Schuster, senior corporal and special projects coordinator of the Dallas Police Department. “Today’s control rooms go beyond traditional displaying and monitoring. Integrated technology allows information to be shared quickly, accurately, and effortlessly,” said John Stark, senior director, Collaborative Visual Solutions at Christie.